A young woman, struggling to expand her London dollmaking trade, finds a surprising customer in Queen Marie Antoinette, an avid doll collector herself. Paris, France. Claudette Laurent, the young daughter of a renowned dollmaker, and her best friend, Jean-Philippe, join the French people in welcoming their new princess, Marie Antoinette of Austria. They are determined to see her or die trying if need be. Treated with kindness by this lovely and gentle princess, Claudette never really forgets this day. Years later, the young girl loses all she has in a fire that ravages her neighborhood. Her beloved parents, the doll shop, her life, everything suddenly disappears. Even her sweetheart, Jean-Philippe is nowhere to be found. Desperate and alone, she decides to embark on a new adventure, London, leaving her country and everything she knows behind. On the boat that takes her to her new home, she meets Beatrice and her daughter, Marguerite. With the help of a local priest, she finds work as a maid in an English household with her new friends. They work hard but are constantly the target of the other servants who look at them with suspicion. During a dinner at her mistress' house, she meets William Greycliffe and we immediately feel something will happen between these two. From the first moment I opened this book, I simply couldn't let it go. Even making a pause over dinner was almost a sacrifice. The vivid descriptions of the dollmaking world grabbed my attention from the very first instant. The scenes at the London shop were entrancing. I could almost smell the wax and imagine the workroom as if I was there. I knew next to nothing about this art and since then I've been searching all over the internet to find as much as I can about the subject. Claudette is a very realistic character who knows her strengths and her faults. Her father was a famous artist and she tried to learn as much as she could from him. Talented and hardworking, she was not a young miss who spent her days lazily. Her future and success lies in dollmaking and her goal is clear, open her own store and continue her father's work. A woman artist in the 18th century who doesn't need a man to run her business and never backs down to achieve her dreams is certainly someone I would admire. It's quite refreshing to read a story about a self-made woman. William Greycliffe is quite the mysterious man all along the story. Even when we find out more about his life, a part of him always remains in the shadows. His attitude towards Claudette's profession is immediately remarkable. A man who admires his wife's independence and work is after my own heart. I also enjoyed how the author describes the unstable post-revolutionary Paris. The cruelty of those times was gut wrenching reaching his peak with the execution of some historical figures like the attrocious murder of the Princess of Lamballe. The Queen's Dollmaker is one of the most original books I read in 2009 and I have only one thing to say to Christine Trent: I crave for more! After reading the author's post Why I Love Unusual Historical Professions, I truly hope she will continue to share with us these unexplored worlds. Her next novel The Wax Apprentice is schedule to 2011 and I'm anxiously waiting for the release. To celebrate the release of her novel Christine Trent is offering a copy of The Queen's Dollmaker not only autographed but also personalized for the winner. Oh, now I wish I had of read this one! LOL! Sounds like it was a great read! Have been hearing great things about this book.Thanks for this giveaway..
After your raving review, I must read it! Thanks for the opportunity for such a great giveaway! What an original premise for a great story! Enjoyed your review! Thank you so much for the entry! I've been reading lots of wonderful reviews about this novel. Thanks for the giveaway. Such an interesting setting and premise! This sounds like a book I would love to read. Thanks for the great review! Please enter me in the giveaway. Let me get the tea kettle going, then I'll change into my PJ's and curl up with this book! I'm with Marg on this one. I wish I had accepted a copy. Sounds wonderful and is going on my TBR. Please enter me... Thank you!! I looked at this book today at bookstore and it looks good.. I am drooling over this book! I would love to be entered! I am so looking forward to reading this book, I love dolls and to read about the history will be wonderful. Thank you so much for this giveaway. Since I just finished reading Mistress of the Revolution by Catherine Delors, which I enjoyed very much, I am looking to line up my next French Revolution read! This one looks great and I have read some great reviews. I'd love to be included in the draw. All I've read is good reviews about it, so please enter me to win it. Thanks. I would love to read this - it looks fabulous! Thanks for the lovely giveaway! Everything I've read about this book tells me I'd love it - thank you for the giveaway! Sounds like a great book. I love reading about the French Revolution. I want to read this book too !! I think I'll love everything about it !! 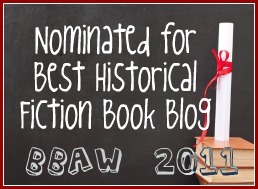 Thanks for this-I love historical fiction. I have read so many good reviews for this book. Please enter me. This one was already on my list! I'd love to win a copy. I'd love to read it! Please enter me. The book looks great. Please count me in. This book looks amazing! Please enter my name in your draw. Thanks. This looks like a lovely read, thanks for the opportunity to win it! Wow, sounds like a great book that I'd love to read! Please enter me to win. What an interesting concept for a historical novel - I'd love to win a copy! Thanks for the giveaway.